A couple of my new friends have been looking for pictures of Our Lady of China. So I am posting them here for them. A priest, a rabbi and a minister walk into a bar. The bartender looks up and says, "What is this, some kind of a joke?" 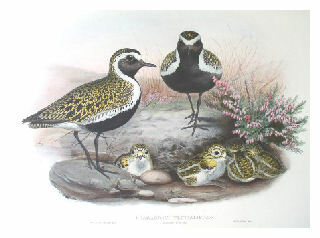 Well, I spotted my first Golden Plover of the winter season! 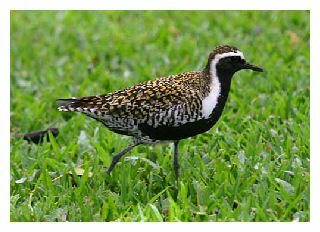 For those of you who aren't familiar with this migratory bird, it lives in Alaska and then flies all the way to Hawaii for the winter. Here is a little Catholic tag I made today. I made them in two different sizes. Feel free to save it on to your own computer for your use. Father Stephanos touched on the subject of the liturigical dance. Silly, but he sure makes a point! I never heard about liturgical dancing until I moved to Hawaii. My family and I then experienced it personally at a few of our parish's Masses. However, at that time we didn't know the strange swaying during the offertory had a name. For a brief period in time, our Mass tried something new during the offertory. I seem to remember a few women walking down the center aisle, each carrying a wooden bowl, probably made of Koa. However, they just didn't walk..they walked a few steps and then stopped, stepped back and then walk a few steps. This pattern continued until they reached the waiting priest at the altar. So that was a liturgical dance? Who knew? My second experience with liturgical dancing came when someone from our diocese complained to Rome about the hula not being performed properly during some of our Masses. Now this one was a little harder to detect as being a liturgical abuse. I say that because when performed properly and respectfully, the hula is one of the most beautiful and graceful of all dances. As you may know, each movement tells a story. Did it have a place in the liturgy? I don't know; probably not. However, I believe, certain ethnic customs and traditions are sometimes incorporated into the Catholic Mass. Going back to my first experience with LD, I believe it lasted only one week or so. The pastor put a stop to it...and rightfully so. 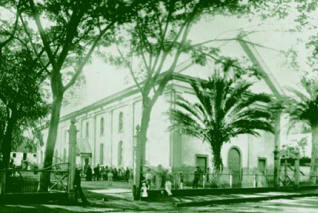 Thank you Easter for reminding us of the 163rd anniversary of our cathedral tomorrow, August 16th. For those of you just joining this Novena for peace in the world, especially in the Middle East and for the conversion of sinners, especially the Muslims and those in our own families. This novena ends next Tuesday on the Feast of the Assumption of Mary. At least we now have a cease fire with Israel and Hezbollah. Picture scanned by me from my collection of Italian Rosary art prints. Source: St. Michael Center for the Blessed Virgin Mary. Click title above for site. The Solemnity of the Assumption is considered as one of the most ancient feast of Our Lady but we don't know how it first came to be celebrated. The Assumption completes God's work in Mary since it was not fitting that the flesh that had given life to God himself should ever undergo corruption. The Assumption is God's crowning of His work as Mary ends her earthly life and enters eternity. In 1950, Pope Pius XII declared the Assumption a dogma of the Faith—that at the end of Mary’s earthly life She was assumed into Heaven. So, now we celebrate the solemnity of the Assumption of the Blessed Virgin Mary on August 15th, a holy day of obligation in the United States. The Assumption looks to eternity and gives us hope that we, too, will follow Our Lady when our life is ended. The antiphons from the Liturgy of the Hours give us some precious words to meditate upon as we consider the Assumption. 1. "Christ ascended into Heaven and prepared an everlasting place for His Immaculate Mother." 2. "The Virgin Mary is exalted above the choirs of Angels; let all believers rejoice and bless the Lord." 3. "Mary was taken up to Heaven; the Angels rejoice. They bless the Lord and sing His praises." 4. "Today the Virgin Mary was taken up to Heaven, rejoice, for she reigns with Christ forever." Rejoice, O Mother of the Lamb and Shepherd! Rejoice, O pasture of spiritual sheep! Rejoice, O defender against unseen enemies! Rejoice, O opening of heavenly gates! Rejoice, O unending boast of the apostles! Rejoice, O invincible boldness and strength of the martyrs. Rejoice, O sure confirmation of our faith! Rejoice, O bright knowledge and vehicle of grace! Rejoice, for you spoiled hell forever! Rejoice, for the Lord clothed you with his glory! and the author of all life. Response: Accept today the homage of our prayer. and keep us free from evil. God, our Father, You chose the lowly maiden of Nazareth, to become the mother of your eternal Son. Through the intercession of her prayers make us, your children, grow daily in the love of you, our Father, and in the love of all our brothers and sisters in Christ. Send your blessing upon our table, upon those who prepared this food for us, and make us always mindful of the needs of the poor and the hungry. We ask this of you through Jesus Christ, Son of God and Son of Mary. Amen. Hat tip to Sunny (click title above for the post in its entirety) of Faith and Country and Denise. In this post-feminist age where men are still learning remedial masculinity, we have a model of manhood lived heroically which we would do well to emulate. 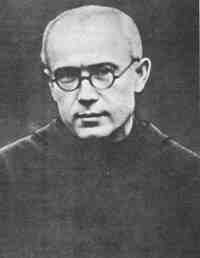 In the early twentieth century Poland gave us that manly priest, John Paul II, but also his hero, Maximilian Kolbe, priest, missionary, spiritual father and martyr of brotherly love. St. Maximilian’s feast day is August 14th, the vigil of his beloved Virgin Mary’s Assumption and the day which commemorates the conquest of virile love over the totalitarian creeds of his generation. Mahalo Trenton for another Irish joke. No disrespect intended. The Trooper says, "Sir, have you been drinking?" < Our pastor Fr. Joe G. gave a wonderful homily today on today's readings and the Gospel. He mentioned how in a Catholic Mass, we know what is going to happen next, the steps, etc. However, he cautioned us it can make the Mass rote for us. He then reminded us what the Consecration is all about and that we have to make a connection between Holy Communion and Jesus. I am not by any means doing his homily any justice but I did want to touch on the main points...that Jesus wasn't kidding around when He told us that He was the Bread of Life.